View of chamber from E. Including Mr Ian Parker and Mr Stratford Halliday, both RCAHMS. View of chamber from E.
View from E showing orthostats forming S half of the facade. View from E showing the S slab and end slab of the innermost compartment. Chambered Cairn, Clettraval 4th-3rd millennia bc Neolithic tomb of a rectangular form associated with the Clyde area, but virtually unique in the Hebrides. Originally wedge-shaped with a compartmented chamber, this 'long cairn' has been much robbed, although most of the large slabs supporting the chamber walls survive. To its west, the site of an Iron Age wheelhouse. 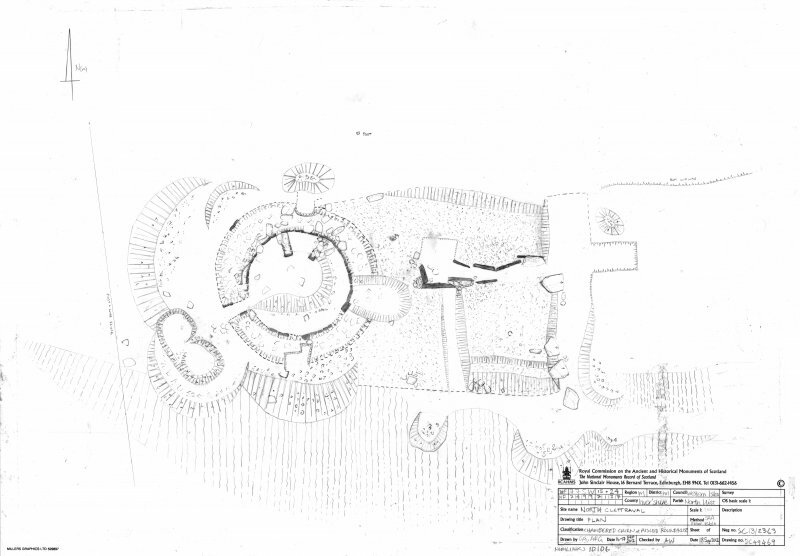 A Clyde-type, chambered long cairn, wedge-shaped, 95ft (29m) long E-W with, at the E end, an impressive facade, mainly orthostatic, through which the chamber, c. 34 1/2 ft (10.5m) long, was entered and in front of which was a paved forecourt. A kerb consisting of massive blocks, averaging 2 1/2ft (0.7m) high can be traced in stretches. 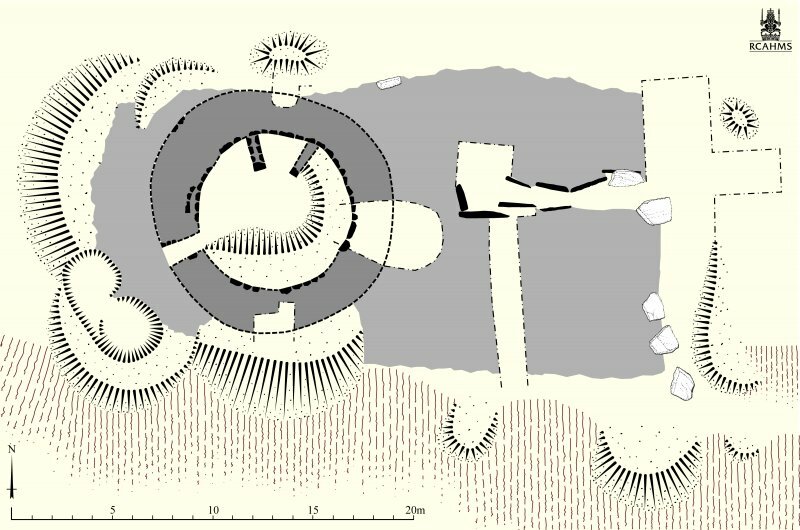 The cairn was severely damaged and robbed for the building of an iron age aisled round-house (NF77SW 24) which was inserted into its W end. The site was excavated by Scott in the 1930s and 1940s; finds from the cairn, now in NMAS, include beaker sherds. E Beveridge 1911; RCAHMS 1928;W L Scott 1935; 1947; A S Henshall 1972. This chambered cairn is so mutilated that only the chamber and passage are surveyable. 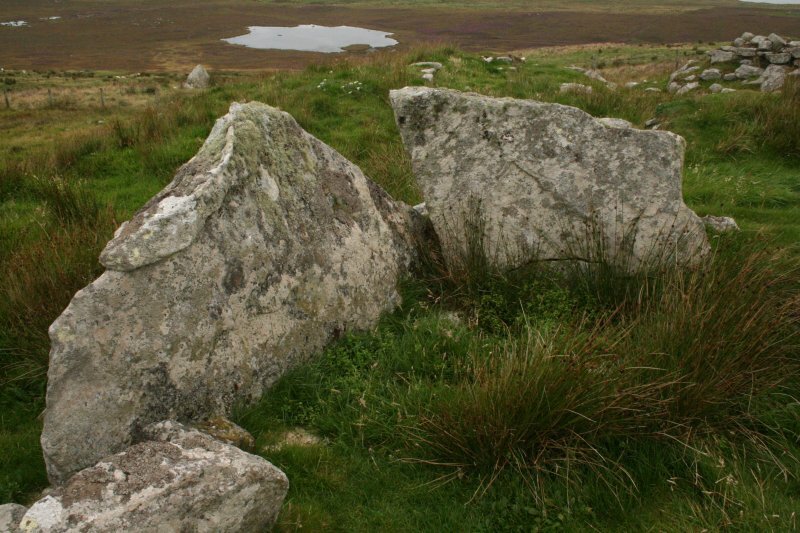 This chambered cairn is situated on the leading edge of a terrace in peat moorland and is largely as planned and described by Henshall. The cairn material has been heavily robbed for the construction of an Iron Age round house that overlies its W end (NF77SW 24). 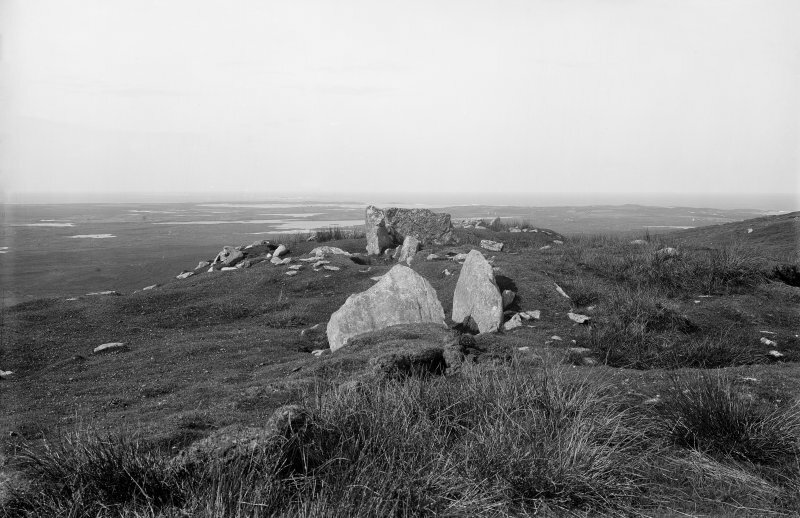 At its E end, the orthostats of its once impressive facade have fallen and lie displaced, those on the S originally forming a near continuous line of six slabs reducing in height towards the outer edge of the cairn. 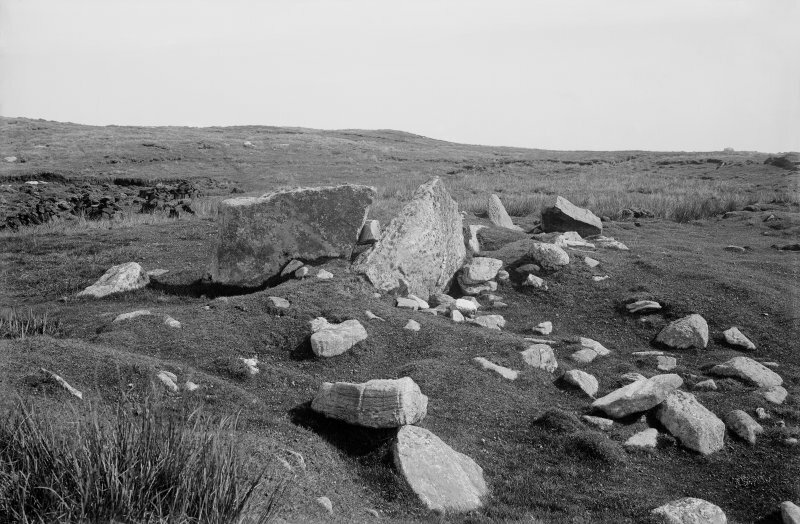 The chamber, entered from the E, comprises five compartments and is set on a slight curve, though it is not central to the surviving cairn material. 233. Segmented Cairn (ruined), South Clettraval. 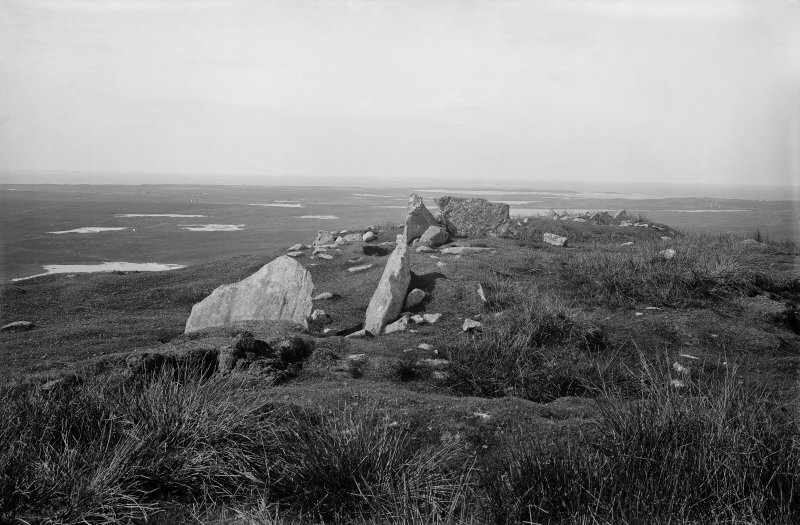 About 400 yards south-east of the summit of South Clettraval and about 450 yards north-west of the chambered cairn (No. 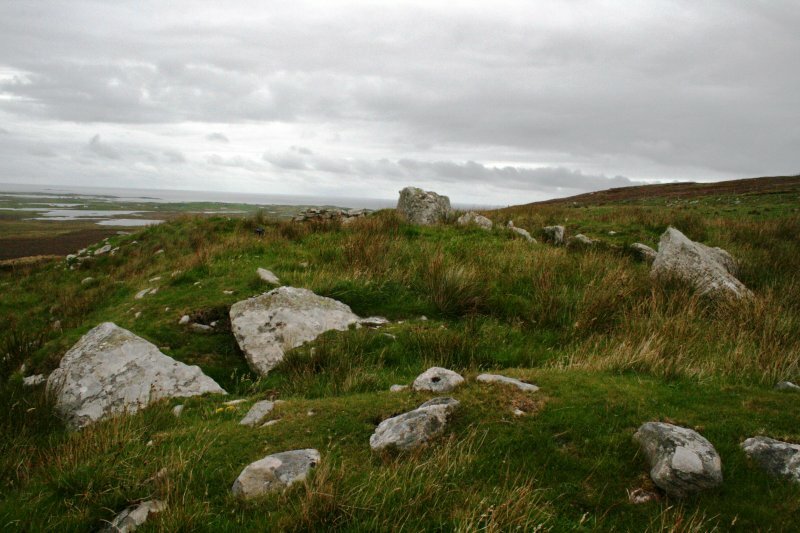 234; NF77SE 14),at an elevation of about 400 feet above sea level, is a fragment of a segmented cairn, the stones no doubt having been utilised in the construction of the dun (No. 178; NF77SW 24), which encroaches on the western side of the cairn. 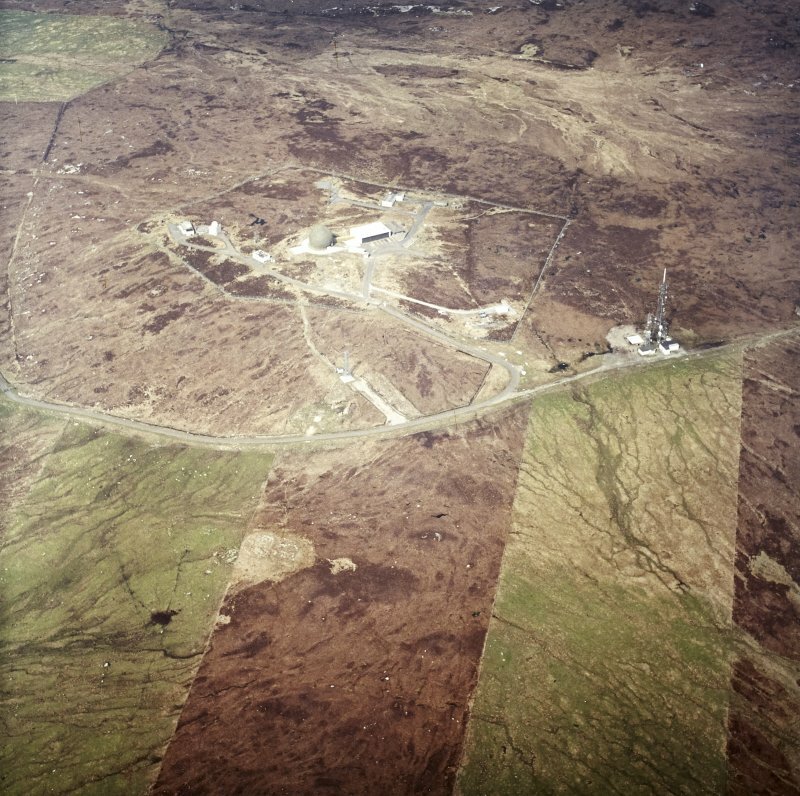 The whole of the mound has disappeared with the exception of a slight heap lying to the south of the megalithic long chamber which was covered by the cairn and which has partly survived. Of this chamber and the entrance passage the western end slab, a stone 5 feet 2 inches in length, 3 feet in height, and 10 inches in thickness, and four of the slabs on the south side remain in situ, the south-western corner of the chamber being undisturbed; the side slabs reading from the west measure 8 feet6 inches, 5 feet 5 inches, 4 feet 4 inches and 5 feet 6 inches in length respectively, the extreme slabs being 3 feet and 2 feet 9 inches in height. The chamber and passage, which run east-south-east and west-north-west, have been 30 feet in length, and, judging from the slab at the west end, the former has been about 5 feet in breadth at that part. Parallel to the most easterly side slab, and 2 feet to the north of it, the edge of a slab just appears above ground, possibly giving the width of the passage near its entrance. To the south is a displaced stone of considerable size. Visited by RCAHMS 9 September1914. NF 7499 7135 During the course of a field visit by members of the Society in April 2008 it was noted that a cup-marked stone was lying loose near the base of the S side of the cairn. The stone measured c0.25 x 0.25m and the pecked cup mark was 75mm in diameter. 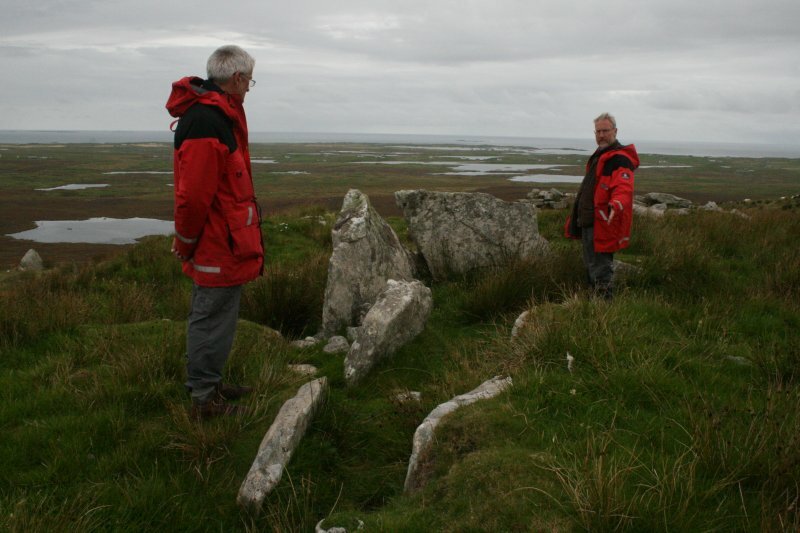 The stone was left as found and the Western Isles archaeologist notified. 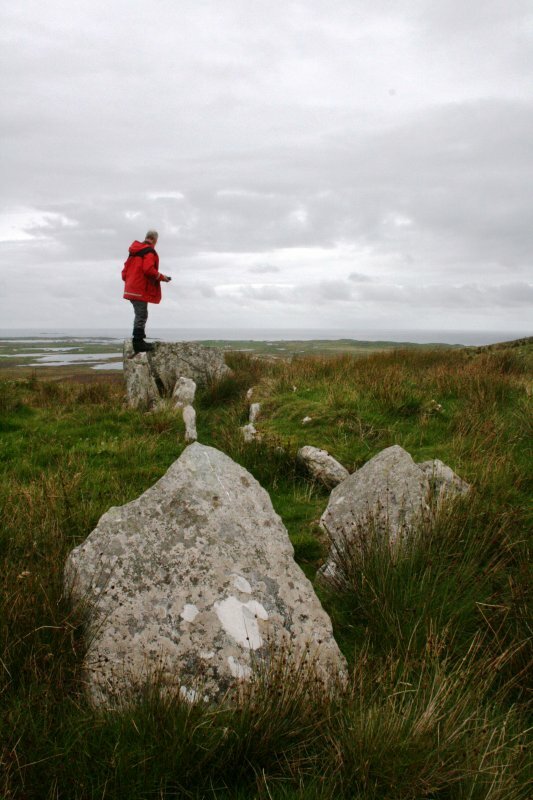 A measured survey of the cairn and roundhouse was undertaken by RCAHMS.